After easily disposing of its opening round opponent, top-seed UCLA gets its first test of the tournament when it faces No.9 seed Texas A&M on Saturday night at the Honda Center in Anaheim. UCLA (32-3) downed Mississippi Valley State, 70-29, on Thursday to advance to the second-round. Freshman Kevin Love scored 20 points and grabbed 9 rebounds as the Bruins held the Delta Devils to an anemic 19.7% field goal shooting. The Aggies (25-10) advanced to the second-round by defeating No.8 seed BYU, 67-62. Texas A&M junior Josh Carter led the Aggies with a career-high 26 points and making 6 of 10 three-pointers. Senior center Joseph Jones added 10 points and 12 rebounds. UCLA and Texas A&M have faced two common opponents this season. The Aggies beat Washington at home, 77-63, and lost to Arizona, 78-67, in Tempe. The teams are familiar with each other and the arena setting. The Bruins edged the Aggies, 65-62, last season in the Wooden Classic at the Honda Center. Texas A&M has undergone some changes since last season, although much of its roster remains the same. Head Coach Billy Gillispie left the Aggies after last season to join Kentucky and Mark Turgeon from Wichita State was hired in his place. Acie Law, now in the NBA, was the team's captain and leading scorer. The 2007-08 Texas A&M team misses the leadership and point-guard play of Law, however, its a team with more size and depth on the front line. Similar to last season, the Aggies are a very physical team, like the Bruins, they bump cutters and hedge screens aggressively and play a tough man-to-man defense. In addition, they are an excellent rebounding club, out-rebounding teams by +7.2 margin per game. UCLA's 6'9 freshman star Kevin Love should expect to get a lot of attention from the Aggies who sport four players taller than 6'9 in its regular rotation. Its expected they will expend all their fouls to battle Love underneath. Center Joseph Jones (6'9, 255, Sr) has not had the type of senior season some expected of him. Inconsistent most of the season, he's averaging 10.4 points on 48.9% field goal shooting, both well off his career numbers. Jones is averaging just 5.3 rebounds in 24.3 minutes. However when his game is on and he's active, Jones can be difficult for an opponent to defend. He possesses a good short-range jumper and can finish strong around the basket. Starting at power forward is another 6'9 big man, Bryan Davis (6'9, 250, So) who is averaging 8.7 points on 52.6% shooting and 5.0 rebounds. One of the team's top shot blockers at 1.1 per game in 22.7 minutes, Davis is a good help defender who will work to keep Kevin Love in check. Off the bench, the Aggies bring in two even longer players in DeAndre Jordan (7'0, 260, Fr) and Chinemelu Elonu (6'10, 235, So). Jordan, a high school phenom, was expected to be an impact player this season, however, he has fallen out of favor recently with Coach Turgeon, averaging just 5 minutes over the last three games. At 7'0 and wide wing-span, he can change shots in the paint. He's averaging 8.0 points, 6.1 rebounds, and 1.3 blocks a game. Jordan and Kevin Love are good friends and often faced each other in AAU play. UCLA's 6'8 forward Luc Richard Mbah a Moute sat out his second straight game on Thursday due to a sprained left ankle. He has been working out at full speed in practice and will be in the starting line-up against the Aggies. The Bruins will certainly need his size, along with Lorenzo Mata-Real, Alfred Aboya, and James Keefe, to help Love manage play underneath. Texas A&M's leading scorer Josh Carter (6'7, 200, Jr) is averaging 12.3 points and hits on 37.9% from beyond the arc. He's a streaky outside shooter who can carry his team offensively, as he did against BYU with 6 of 10 three-pointers. Carter can also slash and get into the paint to finish around the basket. UCLA's Russell Westbrook will likely get the tough assignment of shadowing Carter. Despite giving up four inches in height, Westbrook has the physical skills to keep the ball out of Carter's hands and strength to prevent him from getting into the key. If Westbrook is unable to deal with Carter's size advantage then perhaps Coach Howland could use Luc Richard Mbah a Moute, but his gimpy ankle may challenge him to keep up with Carter. 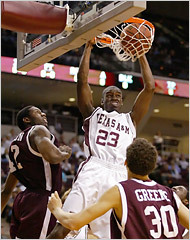 In the backcourt the Aggies sport two combo guards in Donald Sloan (6'3, 205, So) and Dominique Kirk (6'4, 185, Sr). Kirk averages 8.6 points and 3.5 assists. He is the team's top three-point percentage shooter at a solid 42.2%. Sloan averages 9.4 points and 3.5 assists. Both players take good care of the ball although not stellar playmakers. Darren Collison's pressure on the ball will be a key to UCLA's success tomorrow. This will be a defensive slugfest similar to last year's Wooden classic. The Bruins need to check the Aggies best offensive skilled player, Josh Carter. Usually as Carter goes, so does the Aggies' offense. It will be extremely physical underneath, and Kevin Love is expecting it. "Coach Howland said last year was an all-out battle, all-out war against them," Love said. "So I'm just going to have to go in there, and even if I get fouled hard, whether it is a flagrant foul, I'm just going to have to keep my mind on the game and not feed into that stuff." UCLA will need to bring its "A" game tomorrow from the start with tough defensive pressure on the perimeter and good rotations down low. Texas A&M's defense-alone can keep the Aggies in contention all game long, and if it's offense comes together then they can become a very tough match-up for the Bruins tomorrow. This is going to be a tough one but if we win I think we have easy sailing to another final four esp with all the upsets and Duke sucking this year.